Nier: Automata is less than a month away, coming out on March 7 in the US. What better way to compliment the excitement than by showing off more of what awaits you in game! 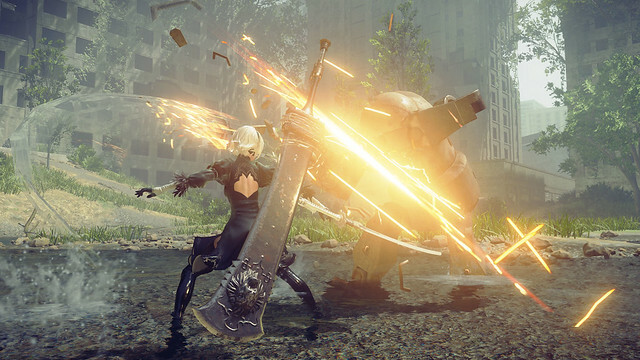 PlatinumGames is adding to its pedigree of action games with Nier: Automata, but let’s not forget that there are also elements in this game that any RPG fan can appreciate, combined with unique twists in this incredible, post-apocalyptic world. The 14th Machine War is upon us, and that means other androids need help. Things break, things go haywire, and as a member of the elite YoRHa squad, it’s part of your job to aid the Resistance and do what’s necessary to win the war. Aside from the main storyline, you will find hubs that provide plenty of side quests to enrich your experience as you attempt to reclaim the planet for mankind. The world is in ruins, but that doesn’t mean there aren’t hidden caches strewn across the harsh, dystopian landscapes. The game is open world, and with double jumps, mid-air dashes, and super speed, 2B can reach heights and treasures that no mere human ever could. Mankind has fled to the moon… but life is not completely gone. Yes, don’t forget about the wildlife that inhabits Earth! Using special items to lure them, you can mount creatures to traverse the world and even attack your foes until they’re scrap metal. I’ve always loved games that let you dual wield weapons. Sure, sword and board is nice and classic, but there’s just something so awesome about carrying two deadly weapons and swinging them carelessly at your enemies. 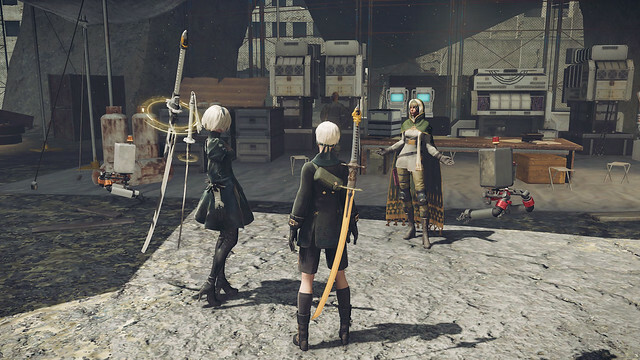 Players can interchange freely between four different weapon types during battle. The scope of action goes even deeper by switching between weapon sets and charging your attacks. Being what you are, an infantry android who’s programmed to destroy machine lifeforms, you are able to power yourself up in a multitude of ways. Powering up means more than just leveling. The higher level you are, the bigger the boost to your hit points, defense, and attack power. But, with plug-in chip upgrades, 2B can gain new skills that you’ll need to survive against the machines. 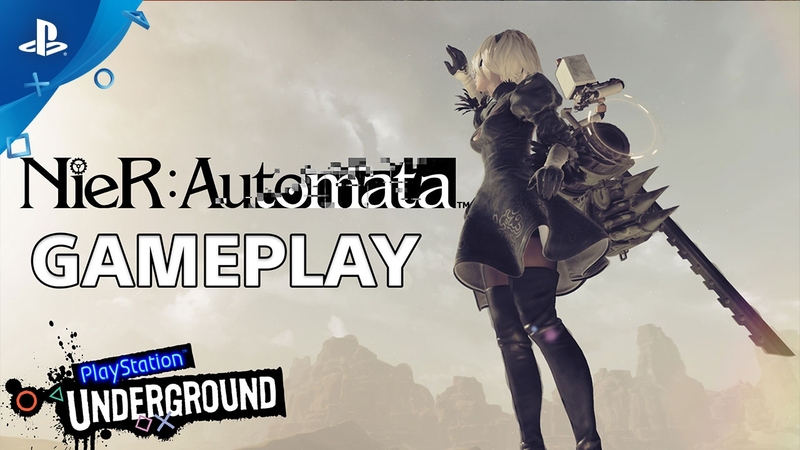 We hope you thoroughly enjoyed watching us play Nier: Automata on PlayStation Underground. If you want to try it right away, you’re in luck! There’s a free demo live at PlayStation Store for you to play to your heart’s content. We want you to know we’re reading all your messages and we’re extremely excited for you to play the game! In the meantime. 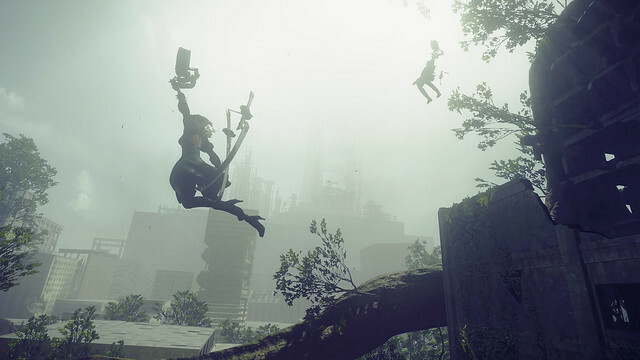 Our friends at PlayStation.Blog EU have even more details on Nier! I can’t wait for this to be in my hands. Was there any mention of a soundtrack being in the works? How about an artbook? Though the dying situation interests me the most, any chance of rogue androids coming across your body’s? Setting you against an invader? How about in the middle of a boss fight? NieR: Automata™ Black Box Edition includes an Art Book and OST. It sold out in January after being available for a month. The soundtrack for NieR: Automata is due out March 29th in Japan for $28.00 (three discs of music), so most imports sites have it up for order already. Not sure if we’re get it over here though, since I’ve yet to see anything on SE’s site. Nier Automata looks so great! I tried the demo and tell you what this is the first game in so many years that made me play the demo more than once now I’m so in love with this game and I can’t get enough! I feel like that Nier Automata will be the first worthy game for me to invest my time seriously on my new PS4 Pro. But my only concern is about the voice-acting options in the game (and for which zone) since I can’t find the clarification about this anywhere on the net so I’m hesitated to pre-order the game sadly. What are the issues with voice options? The full game will be just like the beta in offering the choice between English and Japanese. I don’t see why an option in the demo would be removed from the full game. During the PS meeting you said this was PS4 exclusive but I hear people saying it’s going to be on PC. Which one is it ? It is confirmed for PC as well. No confirmed date though to my knowledge. Nowadays exclusive just means not on another console. Frequently ‘exclusives’ get released for PC as well. Will the game have HDR ? Excited!!! I loved the demo. March is going to be a crazy month of things. We’re so glad you loved the demo :) March can’t arrive soon enough, am I right?! Biggest Nier fan on earth. The concert was amazing. I’ve got the OST always in my van, got the 3 comics, the game and Drakenguard 3 Kane dlc. Disappointed I don’t own any competitor consoles to get the Grimoire Weiss dlc. The English voices of the original were popular ones from other games and anime. I must note that the BEST voice performance in a video game ever done was Liam O’Brien as Grimoire Weiss. I’ve been playing games since Intellivision days and this was the best performance. Also many game storylines pale in comparison to the original Nier. Needless to say I have this preordered and saw the devs playing on a Moose and Boar. What I’m excited for the most is Devola and Popola, Emil and whatever the ??? is in the trailer. Even if it’s not someone from the original, Devola and Popola is confirmed and curious to see how/why they’re in it! I’m currently replaying Nier this month in anticipation and took a day off work on March 7th to play all day. Also can’t wait to hear the full OST! Also, are there any Nier Automata avatars on the way? You don’t need to know the story of the previous Nier to play this one, but I do hope you thoroughly enjoy the replay! I skipped the first Nier for a single reason: Speedrunning trophy. I hate speedruns on RPGs. If Drakengard 3 did not have bad reviews I would get it for PS3, but skipped it also, never heard of Drakengard 1 or 2. But I must say, after playing the demo, Nier Automata is march’s 2017 best game on my book. It was my first Platinum. The speed run was very very achievable with around 9+ HOURS left to spare lol. Being a trophy hunter with over 6,000 and 40 Plats, you should never skip a good game because of trophies. They do absolutely nothing. I am a hunter like you, but would never pass a game due to trophies. I’ve been playing games since my dad had a Pong system and an Intellivison, so imagine I never played games without trophies..might as well not be a gamer. I can’t wait to get my Black Box Edition! This game looks so good! I just hope the story is as dark as Nier was. I love the fact that they played along with android and that when you die you just get a new body! Me too! That dark mood and music set such a theme for the game. It’s a really cool death mechanic right? I’m so glad you were able to snag a Black Box Edition! Also to make my daily stop to my axe-man. It just keeps getting better. Loved the demo, can’t wait to play more. While I am importing it since the Japanese Black Box Edition comes with an item the America one doesn’t, I will be buying the America version as well to support it’s release here. In fact I’ll be buying anything that coming out for it. I love the Drakengard and NieR world that much. There are too many awesome games coming out in a very short period of time. I’m grateful and financially burdened by this prospect. REALLY WANT that Black Box Edition so bad but it’s been sold out over a month now, really hope it restock just one more time before release day please can’t find news about it at all anywhere. Really want that awesome figurine!